This month’s Genre has been chosen by Simon of Moustache Movie News and it is Road Trip Movies. Try to think out of the box! Great choice Simon! 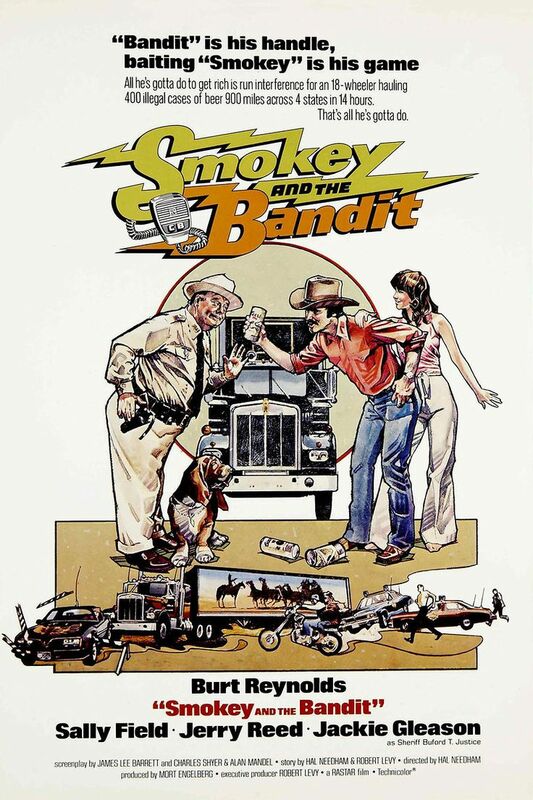 Brief Synopsis – A wealthy businessman and his son make a bet with a trucker that he can’t deliver a load of bootlegged beer from Texas to Georgia in less than 28 hours. My Take on it – I saw this film so many times on cable as a kid and always had a blast with it. Burt Reynolds was born to play this part and it is truly one of his most iconic and recognizable roles. The concept is genius and the combination of car crashes and high speed chases keep this interesting the whole time. This film is so much fun to watch because it has constant momentum the entire way. Jackie Gleason was a great choice as the lawman pursuing Reynolds and his crew. He gets the tone of such a character just right and does it hilariously. His perseverance is great and you know that he is the kind of man who will do anything and everything needed to get his kind of justice which makes it so enjoyable to watch. Jerry Reed co stars and also wrote and sung the music for this film which is so catchy and helps keep the beat of the story moving along. They made a few more films in this series, but this is the only one really worth watching. Bottom Line – Great concept that Reynolds was born to be a part of. The film is so much fun to watch and the idea doesn’t get boring because there is so much momentum the entire time. Gleason is amazing as the lawman pursuing them and his personality and presence is so enjoyable to watch because he has no limits in his pursuit of his style of justice. The music by Reed is quite catchy and helps keep things so much fun throughout the entire journey. This is the only one of the series that is worthwhile seeing. Recommended! Genre Grandeur Worthy? – Extremely fun film that is a nonstop race across the Southeast of the US. Comes close, but still doesn’t manage to be amazing!